Five days ago, it was the same team, the same arena, the same high-scoring affair. Only tonight, it was a Quinnipiac chance at redemption for the 96-90 loss LIU Brooklyn handed the Bobcats on March 2 to close out the regular season, as well as an opportunity to rebound from last year’s 78-75 loss against the two-time reigning Northeast Conference champions in the NEC semifinals. Despite Ousmane Drame’s career high 23-point effort and Quinnipiac shooting 46 percent from 3-point range, the Bobcats fell to the Blackbirds for the second consecutive game by a final score of 91-83, cementing the team’s tenure in the NEC with the move to the Metro Atlantic Athletic Conference next season. With the victory, LIU Brooklyn moves on to the NEC semifinals, when it takes on Wagner on Saturday. Ike Azotam, Zaid Hearst, Dave Johnson and Drame all fouled out within the final 5:04, forcing Quinnipiac to go to the bench in the waning minutes. The Bobcats totaled just eight additional points after losing Azotam, and three after Drame fouled out. Free throw shooting, which has been Quinnipiac’s achilles heel this year, was stellar in the first half, as the Bobcats shot 11 of 12 from the line. In the second half, however, Quinnipiac went just 10 for 19 on free throws. In addition, Quinnipiac shot just 12 of 31 from the field in the second half, while finishing 6 of 19. LIU-Brooklyn went on a 18-5 run to turn a 75-68 deficit into an 86-80 lead with 46 seconds to go. In the first stanza, Evan Conti powered the Bobcats out of the gate, dropping seven points in the initial five minutes of play to give Quinnipiac the 13-10 advantage. Later, Shaq Shannon tallied five points of his own, including a shot from beyond the arc. In closing out the first, Drame added nine points in the final 7:38, solidifying the Bobcats 47-43 lead going into the break. Azotam also recorded 12 points in the half. In the second frame, Quinnipiac maintained its lead until 5:04 remaining in the second, when the Blackbirds tied the contest at 75. Drame tallied two dunks to his credit, while Jamee Jackson chimed in with a slam of his own. The Bobcats would only take the lead twice in the final 5:04 of play. There were a total of 17 lead changes on the evening, with seven of them coming in the second half, and there were 16 ties. 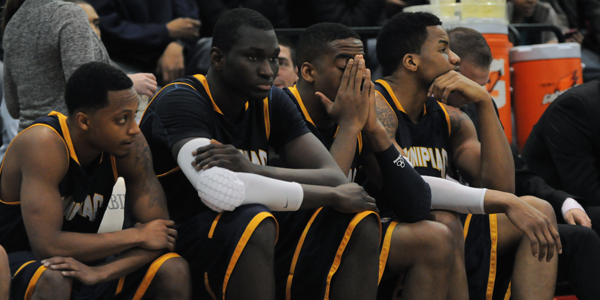 Drame, who averaged 11.9 points per game in Quinnipiac’s second half, also registered 21 points in the March 2 loss. Blackbird C.J. Garner dropped a team-high 30 points on the night, and Jamal Olasewere recorded 20. Garner scored 18 points in the second half, while Olasewere hit a go-ahead jumper with 4 minutes left. Quinnipiac made it to the NEC Championship Game in 2010, only to fall to Robert Morris by two points. The Bobcats lost to Robert Morris the next year in the semifinals by two points, and to the Blackbirds by three last year.